Mint records indicate 904,585 cents were produced in 1799, but scholars are fairly certain the vast majority of these were dated 1798. Our best guess is that only about 35,000 cents dated 1799 were struck, with no more than 1000 surviving today. The true scarcity of the 1799 became evident as early as 1816, when 17-year old Joseph Mickley, (who went on to become one of the most famous of the early US numismatists) seeking a cent from his birth year, could not find an example in what became a highly publicized search. The number of survivors include a 9/8 overdate and the regular date. Both are held in equally high esteem by collectors. Unfortunately, there are a large number of fake 1799 Large Cents around, many of which are alterations of the much more common 1798. Purchasing examples of the 1799 cent that have been certified by a reputable grading service (e.g. PCGS, NGC) is a good safeguard against becoming a victim. 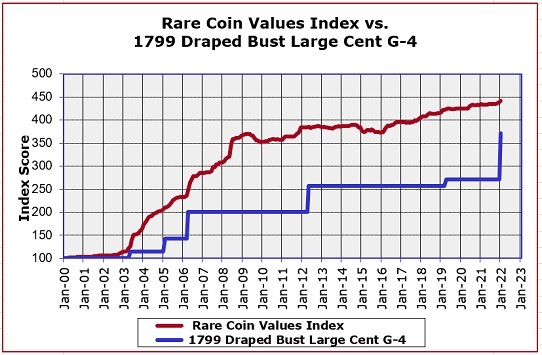 The 1799 Draped Bust Large Cent is one of 87 key date United States coins followed monthly in our Rare Coin Values Index. The blue line above tracks the percent value movment of the 1799 cent since the year 2000. The red line is the result of all 87 key date coins combined. Both start at a baseline of 100. As you can see, the 1799 cent underperforms the Index as a whole, but nonetheless, is a rarity that many coin collectors asire to own. The Index attempts to peg the market direction of rare United States coin sales activity, and is updated every month.